Looking for super-talented Silverlight developer to make this a reality. General feedback welcome. Update: Keep an eye on http://www.metrotwit.com/. Is that just a mockup? Looks nice! OK, ignore that comment. Didn’t take the time to read the actual “tweets”. LOL! Seems nice. What features are you looking for in this work in progress client? P.S. lol @ the replies! Nice, look forward to playing with this. I can’t get enough of Metro. Can Silverlight do standalone applications like Adobe AIR? One of my favourite twitter clients is TweetDeck and it’s an Adobe AIR application…I’d be more than happy to help provide visual feedback if such an application were brought to fruition. Yeap, Silverlight 4 has lots of Out of Browser features. If it’s going to be a desktop app, then you should be using WPF, not Silverlight. reminds me a little DestroyTwitter and blu from thirteen23; any chances for customization, changing colors, language versions etc.? if thats not so complicated, i can translate strings to polish language ;]. Shouldn’t be difficult porting it to WPF. The Reply, ReTweet and DM controls are ankwardly located ; it seems they perform action on the user they are hovering upon rather than his message. Shouldn’t those controls be located say, under the tweet ? This way it would also add some nice whitespace to the layout. It does HAS to be done in Silverlight because that would give it the chance to run in Windows, OS X and even Linux (later this year or if you make a degraded version of it) Browsers and Desktops. It also gives it a easy way to jump into not only WP7 but the now officially supported Symbian and even the iPhone and Android later on via the upcoming MonoTouch 2.0 and MonoAndroid 1.0. So i think that is why Long Zheng wants in Silverlight. At least SL3 for starters should suffice. WP7S current silverlight is SL3 + some of SL4 features and it will not catch up to SL4 until the very end of this year or the start of next year. This is from what Scott Guthrie and others have said in interviews on the record. There is also the fact that the Silverlight for symbian out right now is not even at SL3 level either and Moonlight is also not even at SL3 in full. Starting with SL3 version would be the best way to go right now since SL3 will end up being the longest standing Silverlight release in the overall market. Although I’m a fan of WPF, I think Silverlight might be the better choice. However, you should consider using Silverlight 4 on the desktop, because there is, as far as I know, no MouseWheel support in SIlverlight 3 and not being able to scroll with you mouse would be very inconvenient in a desktop twitter client. Yeah, that is a PITA even in the awesome Facebook SL4 client. Mouse scrolling and focus sliding via the keyboard and the touchpad is pretty much inexistent yet. Really don’t see that drop shadow happening, and without it- I don’t think the design will stand up as well..
it can happen in Silvelright 4 oob with the new chrome feature, i don’t know if i would do that with a dropshadow effect thought, i will go with a png image and fake it, because shaders effects will still make your cpu fire if u resize the window over and over..
changed my opinion this is awesome in wpf! but in silverlight would be good to have on the mac! I think Microsoft should move all of its apps to Metro. I think the new messenger will be slightly metro-ish but could be a lot more. I think it would work best in the Live Mail desktop app. Its supposed to be a simple e-mail program but the new version with the ribbon is the messiest and busiest interface its ever had. changed my opinion this is awesome in wpf! 🙂 but in silverlight would be good to have on the mac! Do you reckon metro will have a big impact in Windows 8, or do you reckon Microsoft will try and keep them separate? I personally believe Metro is suited for portable devices with a certain limit to its functions – I don’t see how it would be suited to the PC. Zune and Media Center are based on metro. Though I don’t see it coming in core Windows UI. It’d be good if it had a ‘Aero’ option. Definitely add an aero-like transparency somehow. I liked the Mix08 scheduling app from thirteen23, but haven’t seen anything as nice since then. Too bad your site’s turning into istartedmetrosomething.com. And fake tweets from SS and BG?? C’mon. Btw is this a Silverlight out-of-browser app? Long may a user give her feedback? The reason why I stick with Blu is because it manages to contain all the different things you need such as retweet,pics, mentions,direct etc in a small narrow window that doesn’t take up much room on the desktop. I would love it if you looked at doing the same. It is possible to acheive as Thirteen prove. How Win 8 and was the lunch with gates? Does win 8 had metro? Btw how was the lunch with gates? Hey Long, I think this is nice. But I was wondering, have you ever thought of putting some support behind touch apps for Windows 7? Reason I ask is every time I see that Windows Touch Pack, I feel disappointed at how limited it is and that there isn’t more emphasis on this. I think a lot of developers get lazy with working on existing platforms only to turn around and get super excited if a company does a “This is NEW and NOW” type campaign, like Apple is currently doing with the iPad. Tablet computing has been around for many many years, but a lot of developers haven’t exploited it. HP has a their slate coming up, and hopefully that will bring added attention, but I wish there was a site or initiative that was encouraging this type of thing more, at least for touchscreen PCs. I only bring it up, because you often do this type of thing, whether it’s UX type stuff, or filling in missing features (Geosense), etc. Any interest? I’m not a developer, so this is just a hope of mine. I do wonder if MS plans any OS releases beyond Windows Phone 7, on the same platform, so that there’s cross development. Is there any site out there that can explain it’s suitability for other types of devices that aren’t running the WP7 interface? This is essentially the current version of WinCE, right? Nice mockup, seems trivial enough to make. Pingback: InaiMathi.de » Metro Twitter Client. Be sure to include some Windows Phone 7, and Zune Desktop Software themes for the user to pick, along side the windows live style blue and white from the mockup. I have Expression Blend if you want any help with the GUI and graphics. Are you planning to build this as an open source project? I would love to participate. 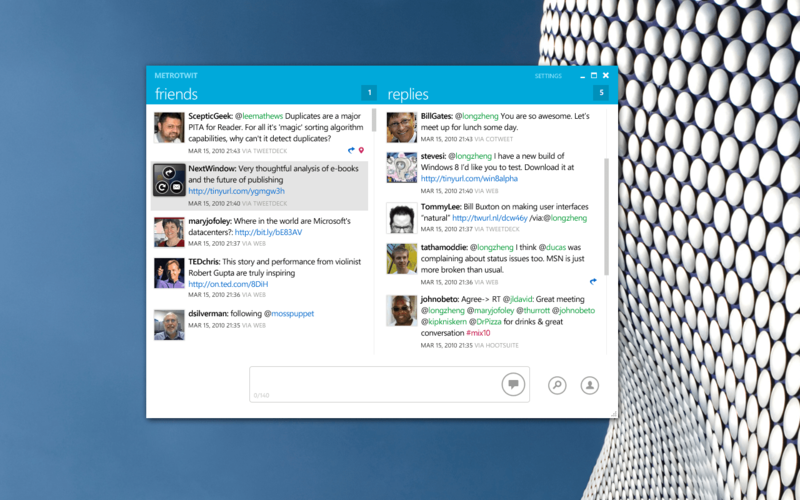 Great mockup, I hope this MetroTwit will be out sometime soon. I will look forward into this. Nice desktop background. Where can I get that? Email me. It’s in the Architectural theme pack on Windows 7. Nice building too, it is the outside of Selfridges in Birmingham, UK for those who want to know! Been there, although there’s probably someone else who actually lives in Birmingham who’d confirm this too! I think you are correct about the building name, although I’ve never been there; I live in Hawaii. Looks interesting, got to play with this one some day. Pingback: Internet Explorer 9 Metro UI é 1º de Abril. | Rafa's Library! If you need a translate to Brazilian Portuguese, I can help. Any think, send a mail to me. That’s a really nice design, well done. Meanwhile, did you make it to lunch with Bill Gates 😉 ? Did you use Microsoft Expression Suite for the whole thing? I think people should take a look and start using the excellent Tweeting Client built upon Windows Presentation Foundation is distributed for FREE! Ive been using this and its looks and features are awesome! when i use MetroTwit, the graphic is suddenly slow, and it disturbs me. Is this app needs more VGA memory and RAM resouces?